Introduced in November 1985 by Megatron, a respected repairer and maker of instruments involved with light measurement, who had bought the liquidated parts, stock and instruments from East Kilbride Instruments. They made significant changes to the galvanometer/magnet mechanism. The meter was originally marketed exclusively by Actina Ltd, a wholly owned subsidiary of Sangers Photographic plc who had previously distributed the Euromaster, but this arrangement was discontinued in December 1987. A variant model, the EuroMaster II Millennium Chrome version was released by Megatron in 2000 as was a rather nice black version. Megatron went out of business in 2010 so the meter is now no longer available. The Euromaster II may well be the last of the series started by Edward Weston so many years ago and I'm sure he would have appreciated the very high quality of its manufacture and the fact that in these days of digital photography it is still used daily by discerning photograhpers across the world. These are the main reasons for the continuing popularity with keen photographers of the Euro-Master II - the latest in the line that started with the original Weston Master I, nearly fifty years ago. The classic design concept of a selenium photocell, an easily-read scale, and a circular calculator dial, is still as valid today as when it was first conceived. The response of the selenium cell is well matched to that of the film emulsion - both panchromatic and colour; this avoids the errors, which can arise, for example when using a cell lacking red sensitivity in evening light. As no batteries are required, you will not be let down at the crucial moment, by running out of power. Unlike many battery-powered meters, the Euro-MASTER II is hardly affected by low temperatures; it has been proven by countless mountaineering and skiing expeditions, even under arctic conditions. It was for instance the natural choice for the recent expedition "in the Footsteps of Scott" to the South Pole. The use of the calculator dial leaves control where it belongs - in the hands of the photographer. You can either simply choose one of the settings given or base the exposure on the darkest object or on the brightest highlight in the scene. Filter factors can quickly be allowed for. 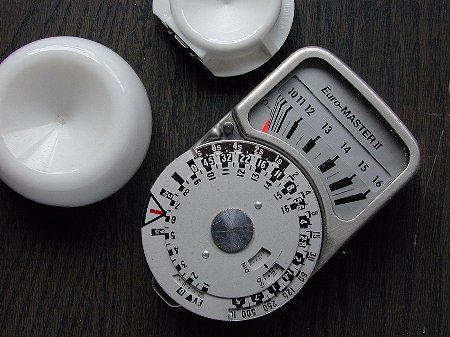 The Euro-MASTER II - It is not just the best all-round meter for the professional photographer, but an essential tool for all those who take their photography seriously. The Euro-MASTER II is now avilable in black from most good photographic dealers; it is supplied complete with neck lanyard , ever-ready leather case, Invercone case, and comprehensive instructions. Or you can buy directly from us at a UK price of £156 or an export price of £141 plus VAT if applicable. Both prices include carriage.